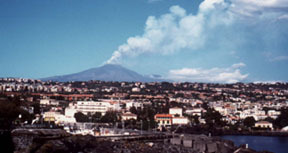 Link to the Web edition timeline showing Etna's eruptions since 1995. For 15 months, from December 1991 to March 1993, Mount Etna in Sicily purged lava from its side, threatening the town of Zafferana. About 230 million cubic meters of lava poured from a fissure on the southeast side of the volcano. This was the latest in a series of 13 flank eruptions at the volcano since 1971 and it was the most voluminous and longest-lasting flank eruption of the last 300 years. Seven years have passed now and it seems that the people living around Etna have been getting used to the absence of eruptions from the volcano’s sides. But, the frequent spectacular summit eruptions since 1995 have served as a reminder that Etna is there and it is active. 1. During the last five years, all four summit craters have been the sites of highly variable and dramatic eruptions that have continued through March 2000. 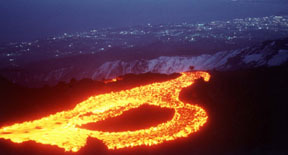 From November 1995 to June 1996, Etna’s Bocca Nuova crater activity remained at relatively low levels, while the Northeast Crater became quite energetic and produced 10 violent eruptive episodes. In early November 1996, Etna’s Southeast Crater began low-level Strombolian activity, characterized by small explosions ejecting fragments of incandescent lava, and by extrusion of small volumes of basaltic lava onto the crater floor. 2. 1999. Photos courtesy of Boris Behncke. Between July and December 1997, the activity extended to the Voragine, a summit crater that formed in 1945 and is also known as “the Chasm.” On July 22, 1998 the most violent explosion of the period produced an eruption column 10 kilometers high. Extensive lapilli and ash fell onto the east and southeast sides, while the first lava flow from the area since 1964 advanced onto the northwest side of the main summit cone. The crater was largely filled in by the end of 1998, making it possible to walk across its floor to a new vantage point of Bocca Nuova. In less than a year the viewing area would disappear. 3. After a few months of relatively low levels of activity, on Jan. 26, 2000, the Southeast Crater began initiating a series of violent eruptive episodes. On Feb. 15, lava fountains rose up to 800 meters from the crater. Ash and lapilli frequently fell in villages and towns around the volcano and fine ash was at times carried up to 50 kilometers away. 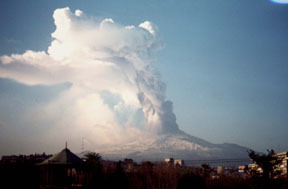 As of late March 2000, more than 40 such episodes have occurred, an unprecedented event in the recent eruptive history of Etna. 4. The activity at the summit craters is attracting tourists and scientists from all over the world. In 1999, about one million people visited the summit area on organized excursions with Etna mountain guides. However, many visitors who go to the summit craters without any guides expose themselves to great risk. Half of the time the weather is unstable, preventing visibility of the eruptive activity and making it easy for visitors to get lost. Even for experts, it is difficult to evaluate when the summit activity is about to become dangerous. It is pure coincidence that no tragic accidents have happened in the past few years. The summer season of 2000 will see a new surge of tourists toward Etna, but they will need a new viewing area. Increased lava production since early March led to the emplacement of large lava flows around the Southeast Crater cone. Some of these flows reached an isolated mountain hut named Torre del Filosofo that had been built in the late 1960s. The lava encircled the concrete building on two sides, piling up nearly to its roof, and burned a small wooden shack that was used by the mountain guides during the summer season as a safe place where tourists could rest and buy souvenirs. 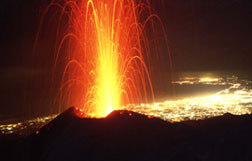 During the almost five years of summit activity initiated in the summer of 1995, unusual simultaneous eruptive activity from two or more summit craters was quite common. Etna produced some 80 to 90 million cubic meters (comparable to the volume of some 15,000 Olympic swimming pools) of lava and about 20 million cubic meters of pyroclastics. This is much less than the volume of the last flank eruption, but about 80 percent of the lava was produced in two large events in 1999: the long-lived effusive activity near the Southeast Crater and lava overflows from the Bocca Nuova. The effusion rates during these two events were close to those of a “normal” flank eruption of Etna. Does this mean that Etna has become more active? It seems it has. No summit eruption of the volcano has produced similar volumes in such a short period during the past centuries. Since 1865, four periods of long-lived summit eruptions are known, and almost all began after a particularly voluminous flank eruption. Etna’s eruptive behavior, for at least the last 150 years, falls in a clearly cyclical pattern. Each eruptive cycle consists of an initial period of repose of several years, followed by long-lived summit eruptions (such as those initiated in 1995 and continuing to the present day) and culminating in a series of flank eruptions occurring in rapid succession. Etna may thus continue producing summit eruptions for another five to 10 years before a flank eruption attacks again. Link to a timeline of Mount Etna's eruptions since 1995. Behncke is a volcanologist from the Dipartimento di Scienze Geologiche (Sezione di Geologia e Geofisica) at the University of Catania, Italy. More information on Etna can be found at www.geo.mtu.edu/~boris/ETNA.html. To comment, send Email to: geotimes@agiweb.org.